It's June already and that means we have a brand new muse at CASE Study. It's the talented and trendy Lisa Spangler! We also have some fabulous new designers joining the CASE Study team but you'll have to pop over to CASE Study to find out all the details!! 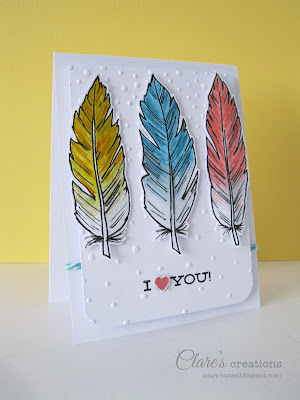 Check out Lisa's first inspiration card for the month of June. I love the stamped feathers on this card, the strips of color (I picked the ones that jumped out at me the most for my card) and the simple white base. So I CASEd these elements. 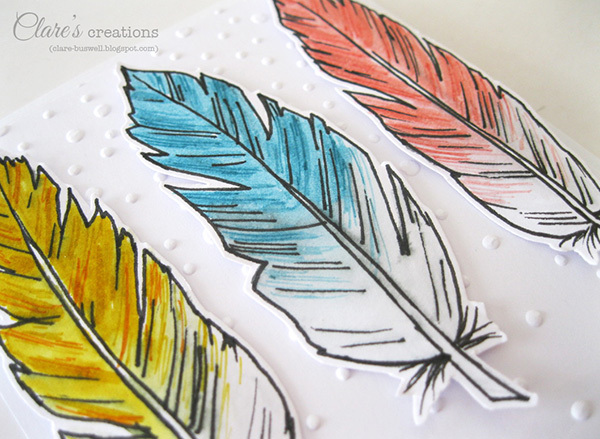 I didn't actually have any feather stamps but I love the feather trend and I really wanted to use them on my card so I just sketched a few. I sketched them in pencil first, then outlined them in black and rubbed out any pencil lines. I like the look of dip dyed colored feathers so I used some Distress Markers to color the tops of my feathers and used a wet paintbrush to blend the color into white. Once they were dry I went back and added some detail using the fine tip end of some Distress Markers. Then I cut them out of course! I kept the base pretty simple with some embossing. The sentiment is from Let's Face It from The Craft's Meow. I also used some Caribbean Twine from SRM Stickers. 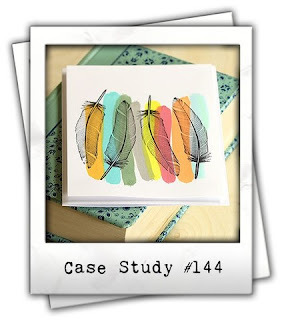 Don't forget to pop over to the CASE Study blog for some more inspiration and to find out who's joining the CASE Study team!! Simple and VERY PRETTY!Mean easy to mail!!! So cute!!! 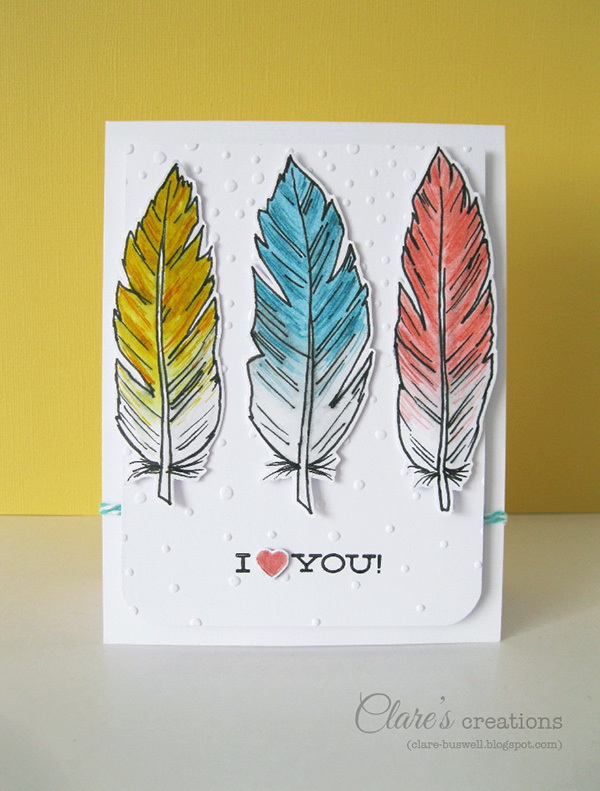 I love the way you colored the feathers! The feathers are awesome...love your take on the inspiration photo!!! 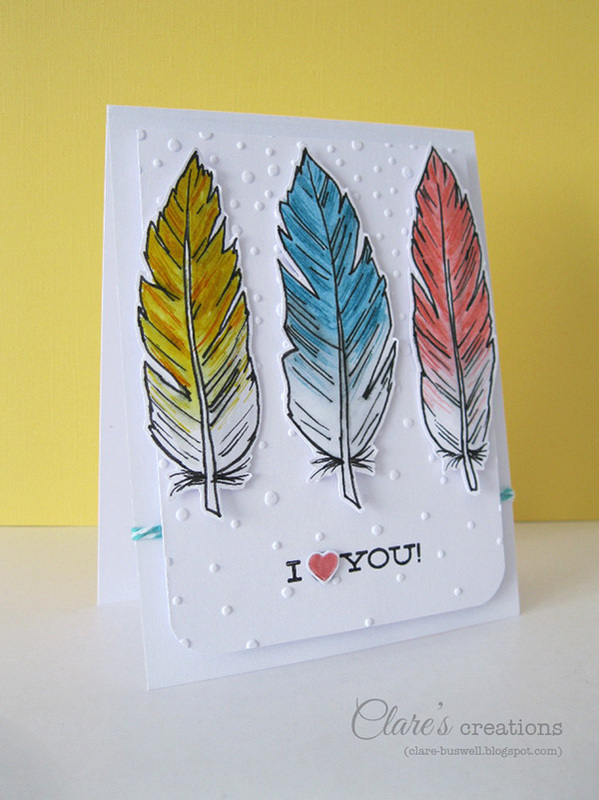 SUPER lovely, just amazed how you used the snow folder, and it is perfect!